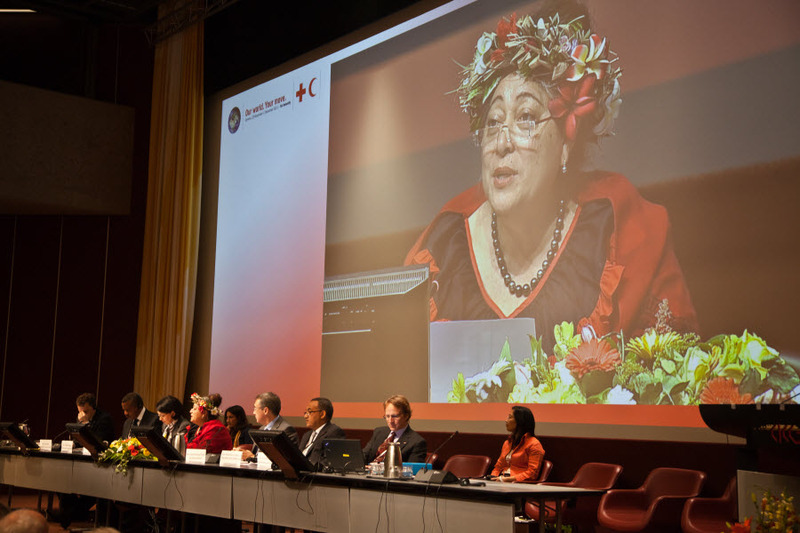 The 31st International Conference (Conference) of the Red Cross and Red Crescent, the world’s largest humanitarian conference, took place in Geneva from 28 November to 1 December 2011 with the aim of strengthening international humanitarian law (IHL) and humanitarian action. It convened 164 States, 183 National Societies, 56 observers, the ICRC and the International Federation under the banner of ‘Our World. Your Move – For Humanity’. The resolution “Strengthening legal protection for victims of armed conflict” addresses gaps in IHL in two areas: the protection of people deprived of their freedom; and mechanisms to ensure compliance with IHL. This resolution invites the ICRC to “identify and propose a range of options and its recommendations” regarding these two areas. The “Four-Year Action Plan for the Implementation of IHL” resolution sets out a series of measures whereby States can enhance their implementation actions. The resolution on “Strengthening normative frameworks and addressing regulatory barriers concerning disaster mitigation, response and recovery” calls for continued progress in International Disaster Response Laws, Rules and Principles and encourages work in new areas of disaster law, including legislation for disaster risk reduction and measures to overcome common regulatory barriers to post-disaster shelter. Two resolutions address barriers to health care: One on “Health Care in Danger: Respecting and Protecting Health Care” gives the Red Cross and Red Crescent Movement a clear mandate to initiate consultations with a view of formulating practical recommendations for making the delivery of health care safer in armed conflict and/or other emergencies. The other resolution “Health inequities: reducing burden on women and children” calls on National Societies and their governments to dismantle all barriers to health, starting with those that deprive women and children of the highest attainable standard of health, a fundamental right of every human being. Two resolutions aim at strengthening local humanitarian action. The first resolution “Migration: Ensuring Access, Dignity, Respect for Diversity and Social Inclusion” ensures the humanitarian assistance and protection for vulnerable migrants. It creates a framework for National Societies to work closely with States in accordance with the Movement’s Fundamental Principles and reinforces their auxiliary role. The second resolution “Furthering the auxiliary role: Partnership for stronger National Societies and volunteering development” highlights the importance of coordinated governmental approaches to volunteering in National Societies and in other voluntary organisations. 391 separate pledges were registered at the 31st International on a wide range of topics relevant to the Conference agenda. These pledges represent voluntary commitments by the Conference participants to carry out specific actions during the next four years in furtherance of the Conference’s humanitarian aims. Many of these pledges were registered jointly by Governments with their National Societies or in regional or other groupings. Report of How can a gender perspective on international humanitarian law make a difference workshop? The 31st International Conference elected the following five members to the Standing Commission.